Although it may be the physical aspect that first draws us towards Yoga, sooner or later we find out that there’s a lot more to this practice than touching your toes or holding a headstand…. The origins of Yoga don’t look much like our modern-day practice, in fact most of the postures we practice today are more closely related to European gymnastic routines and military drills than the original Hatha Yoga… (But I’ll leave that conversation for another time….) The point is, Yoga has so much more to offer than we might first assume. Yoga philosophy is the backbone of this whole practice, and when we look a little deeper into it, we find teachings that can change and transform our minds and lives. Personally, delving into the philosophy was a big turning point in my practice as it brought Yoga into my every-day life instead of just when I was physically practicing on the mat. Although these teachings are completely invaluable, they’re not always that accessible or easy to understand, so as soon as I was offered the chance to release an E-book with YogaMoo, I instantly knew what to write about. This book takes the first two limbs of The Yoga Sutras Of Patanjali – Yama & Niyama – and shows clearly how we can take these practices into our every day lives. Even giving a little thought to each of these aspects of Yoga daily can create a profound shift. If you look a little deeper into the many layers of this practice, you’re likely to come across a book called The Yoga Sutras of Patanjali. This book is often first on the Yoga teacher training reading lists – and for good reason – because it holds the essence of what this practice is all about; ‘yoga chitta vritti nirodana’ or ‘stilling the fluctuations of the mind’. What this basically means (to me), is finding a way to release unnecessary worrisome thoughts in favour of a more calm and clear mind. The Yoga Sutras Of Patanjali is essentially the philosophy of yoga, and is almost a step by step guide to enlightenment…. The philosophy is structured around The eight limbs of Yoga – ultimately the eight steps towards ‘Samadhi’, ‘bliss’ or ‘enlightenment’. Yama = ‘Self restraints’ or ways of interacting with and treating the world around us. Niyama = The ways we relate to and treat ourselves. Asana = Actually translates as ‘seat’ and first referred to a seated position intended for meditation. These days we’re more likely to refer to ‘asana’ as the physical Yoga postures we practice in class. Pranayama = ‘Breath control’ or ‘breath liberation’ depending on your standpoint. Our breath has the power to control how we feel both physically and mentally – when our breath is long, deep and conscious, our nervous system begins to relax and our mind becomes a little calmer and clearer. Pranayama practices offer ways to change our breathing rate to affect our state of being. Pratyahara = ‘Withdrawal of the senses’. Drawing our awareness away from external stimuli and towards our internal. Dharana = ‘Concentration of the mind’. Focussing the mind on one aspect in order to draw ourselves deeper in to concentration. Dhyana = ‘Meditation’ or a deeper state of focus. Often referred to as the point at which we become absorbed in the object of concentration. Samadhi = ‘Bliss’ or ‘Englightenment’. Although a state of realisation, Samadhi isn’t necessarily a permanent state. After long periods of meditation we may enter this way of feeling for a period of time, but after continual and sustained practice we may enter in to ‘Moksha’ or ‘Mukti’ meaning ‘liberation’ or ‘release’ from life’s suffering. Whether you practice Yoga or not, the Yamas and Niyamas help cultivate a more positive life for everyone, no matter who you are. If you’re looking for the tools to become a little more mindful, healthy, happy and engaged in each moment of life, then get yourself a copy and find out how to bring Yoga off the mat and into your life. The E-book is officially released on November 7th, but can be pre-ordered any time before then! If you do not own a kindle, you can download the app HERE and read this book straight from your computer screen. 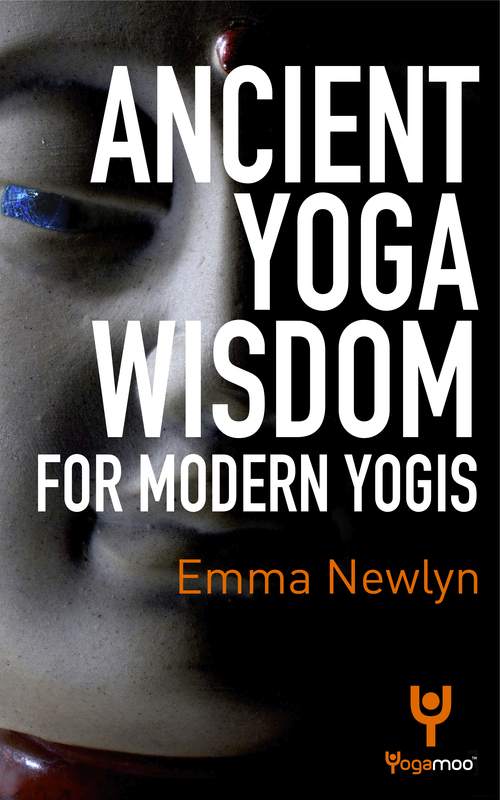 CLICK HERE AND HEAD TO AMAZON TO GET YOUR COPY OF ANCIENT YOGA WISDOM FOR MODERN YOGIS FOR JUST £3.06! Just spoke with the publishers and they said you can download this little app which will then enable you to read kindle books from your computer!